Canvas Duffle Bag for your logo. 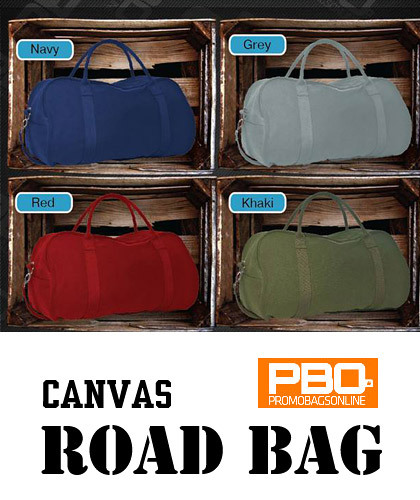 Cotton canvas has a rugged aussie appearance that fits with so well with many events and promotions. Black, Navy, Grey, Khaki, Natural & Dark Red. Embroidery service is recommended for this product. Detachable shoulder strap. Reinforced handles. Embroidery service available for your logo. Navy, Dark Red, Khaki, Grey, Black. Order 20 if logo embroidery service is required on bags. Initial Program Set Up is $90.00 + 10% which includes a sample of your logo prior to production. Your logo can also be used on clothing and headwear etc. High volume indent ordering quotes are also available. Screen Printing is also available for minimum orders of 50 pcs. Normally 3 to 4 weeks delivery or please advise your deadline.